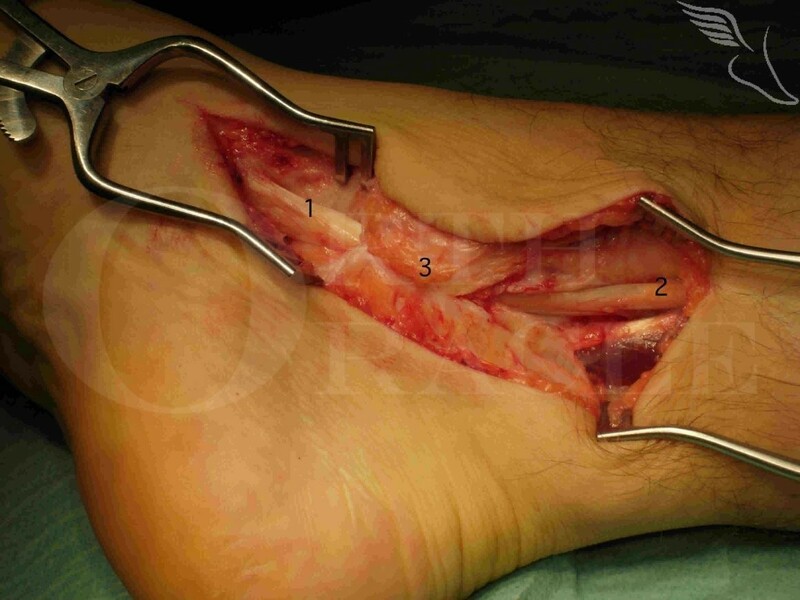 Learn the Tibialis posterior tendon debridement surgical technique with step by step instructions on OrthOracle. Our e-learning platform contains high resolution images and a certified CME of the Tibialis posterior tendon debridement surgical procedure. In the appropriately selected patient a tibialis posterior tendon debridement and repair will provide a very effective (and rapid) means of both halting symptoms and also possibly progression of the tendon degeneration. It is used in the main for patients with symptomatic grade 1 tendinosis, according to the classification system of Johnson & Strom. In other words no functional lengthening of the tendon and with the ability to perform a single heel rise still preserved. A stripping of the paratenon, targeted, limited incisions into all areas of degenerative change and excision and repair of degenerative cysts and tears is followed by a variable period of non-weight-bearing in cast. This may be as short as two weeks, followed by three to four weeks in a post-operative boot and progressively loading the tendon. A return to full function is the norm in patients with non-inflammatory conditions as the cause. Late deterioration is in my experience an uncommon event after an initially successful surgical intervention. Most cases of grade 1 tendinosis however will settle with conservative management using a long post-operative boot and semi-rigid functional foot orthotic as long as presentation is early enough. The fuller reconstruction of the lengthened and mechanically defunctioned tibialis posterior tendon is covered elsewhere on the OrthOracle platform.